I’d like to thank my daughter for letting me borrow her bracelet, and my wife for the shoes and for letting me sacrifice one of her disposable razors. But John Scalzi wanted to win this thing as much as I did. I don’t know what master he trained with, but whoever that wise and sadistic sensei might be, they turned Mister Scalzi into a posing opponent to be feared. John went all out in his own, special way. I’d like to thank everyone for their donations and generosity so far, and John in particular for his willingness to play along. Please remember that the fundraiser runs through the end of the month, and the money raised supports both research into Aicardi Syndrome and the biannual conference which helps to unite these families, connecting them to a much-needed network of support. And remember, there are more goals to come, including the $5000 group pose with me, Scalzi, Stross, Rothfuss, and Kowal! You know you want to see this, and we’re getting so close! Go. Donate. Make the world better, and force more authors to injure themselves in humorous ways for a great cause. « Poses: Round One	» Wait, What Were We Laughing At? I had to vote for Scalzi Jim. Not that your pose isn’t wonderful as well, but his will haunt my dreams. i may not ever be able to unsee it. Dear sirs, this is a delight! My household examined both your efforts, and agree that Hines wins this round of the pose-off. 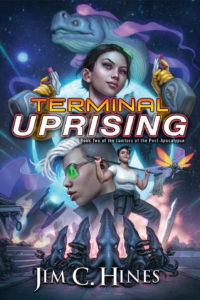 Scalzi’s enthusiasm and effort are good, but Hines has pointed all of his limbs in the same directions as the woman on the cover. I don’t know *HOW*, but he did it. I voted for Scalzi. Not out of joy, but the other thing. I agree with Sigrid. Scalzi’s pose is a thing unique unto itself. I’m thinking about washing my eyes out with soap. Bur strictly on accuracy of pose-replication, Hines wins it. I gotta love the blonde wig, though. And the Little Black Dress. Scalzi went the extra mile with the wig. Such a hard choice- I am impressed at John’s dedication and inclusion of a wig. I feel his left leg placement is more accurate, but he didn’t get the head tilt quite right. Jim doesn’t quite have the left foot at the exact angle, but I swear it looks like he shaved his leg(s) for the occasion. Also his arm placements are just about spot on and head tilt not quite there, but SO close. I’m going Jim for pose accuracy, but serious style points to John for wig. I cry foul: home advantage will surely come into play. Pose-off should have had a neutral venue! I voted for Scalzi — He wore a wig and dress! Sorry, Jim. Your pose was also great. Jim appears to have shaved his legs for this. He wins. Voting for Jim, due to pose accuracy, but damn, Scalzi is rocking that wig! Normally Scalzi would get the style points for the wig, but Jim *shaved*. Jim also got his legs arranged correctly, for a very painful-looking definition of correctly. Sorry John, I voted for Jim. Looks like he shaved his legs and having done that once many years before (also for costumery), my sympathies lie with him. Oh, yeah, I’m going with the shaved legs… anyone can wear a wig, but it takes a man to shave his legs. I had to go with Scalzi too. There was just something about the wig and the look in his eyes. It was almost as if he enjoyed posing. Good luck on the fundraising. I am wondering though: it looks like both of you easily came up with not just the dress and the heels but also the crossbow…. I agree with previous commenters: Hines wins (by a sizable margin, actually) on pose accuracy—BOTH legs are angled correctly, and the head and upper body are properly oriented. Scalzi gets ten points for style, though. This round to you, Jim, for pose accuracy. But good lord, Scalzi’s shot. He’s right. I’ll never unsee that. Shaving! That’s dedication. A wig can be removed, but it takes time for hair to grow back, not to mention the itchy-ness. Plus there’s pose accuracy. Scalzi got the ankle tilt more precisely, but Hines’ head is closer to the original angle, and he has the sort of rounded-shoulder thing going on with the crossbow-holding arm, which looks like it would be unbalancing and possibly dangerous in a hyperextension sort of way. Also, should I be worried that it looks like they both had crossbows lying around the house? Is this an author thing?? Hines wins on technical merit. The shaved legs give him an edge in effort. Style points to Scalzi for the wig, but it’s not enough for him to carry the day. The original is aiming right between my eyes, Jim you’re aiming at my chest, while Scalzi’s aiming at either my wallet or my left test… either way, I’m afraid Scalzi wins. Well played! Gotta go with Jim, who tipped the scales by shaving his legs. But both of you gentlemen rock! Scalzi in a little black dress, heels, wig and crazy eyes…Can…Not…Unsee. That right there is nightmare fuel for at least a week (or until the next pose-off pic). However, Jim gets points for more accuracy of pose and for shaving. That’s the first thing I noticed, actually. Jim’s leg looks better shaved than the woman on the cover picture. Jim wins for accuracy, but Scalzi… man. Some things you can never unsee. Nice job, guys! You’re both awesome, even if you scar my retinas. Mr. Scalzi’s was impressive, but the knee was turned out! I have to vote for you, Mr. Hines. While I will never be able to unsee what I’ve just seen, I think I’m more impressed that both chaps were able to get their hands on such delightful looking crossbows. The wig certainly does bring Mr. Scalzi’s A-game, but Mr. Hines has affected the dead-eyed-kill-me-now look of the source material. Sorry Mr. Scalzi, but you look like you’re enjoying this way too much. Both of these are terrific and horrific equally (though Jim has the most accurate pose), but I had to vote for Scalzi simply for his facial expression. Out of all this, those eyes are the one thing I can never unsee. I voted Hines. Scalzi’s got style points here, but you nailed the pose, and your dedication to the cause deserves recognition. Let us all honor the sacrifice your wife’s razor made for us all. I can’t decide between you two–I am laughing too hard! Before we can have a fair vote surely there should be an entry from @wilw (and possibly Joel Watson). Hahahaha. I can’t decide. Jim has the “hunch” down but John has the eyes. Style points to each (Jim for shaving, John for the wig). I think I have to go with Jim due to pose accuracy but John gave a great effort. That was a hard choice. I agree that Mr. Hines captured the pose far better than Mr. Scalzi, but the look on Scalzi’s face made me laugh. It is unfair to make us choose, but I guess we have to. I voted for Jim because you went above and beyond to shave your legs. That you only shaved one leg wins my vote. That’s …uh…special dedication. I am a a Scalzi fan new to Jim Hines but I must admit Hines has the better pose. Scalzi unfortunately has a slight smirk. Experience I suppose. What interests me (… strangely, oh so very strangely …) is that both of you came up with strappy-ish-like shoes when the model is wearing some closed-toe pump-y-ish things. Did you feel that the Internet needed to see your toes? Or was this some subtle, even subliminal comment on how these poses and representations of women are akin to societal foot-binding? I tried out the pose to see how hard it was (I’m flexible and female, so I didn’t think it would be all that tough, to be honest) and you get the win, IMO. The angle of the squatting leg is actually difficult to manage–staying balanced is much tougher with it angled in the way it was on the cover and you did it. Kudos to you! Jim wins because he somehow managed to get the leg angle right. John’s attempt suffers because his shot is from the wrong angle to get the leg in view, it is a bit difficult to determine how close he got to the upper body positioning (although the balance seems to be different). Alex – Re the shoes, my guess is, Jim and John didn’t go out to buy pumps that would fit them, and it’s easier to stuff a man’s foot into a strappy shoe than a closed shoe. I love me some Scalzi, but had to go with Jim because he nailed the pose. Any reax from Ms. Pettersson? I am pleased that I can now refer to Scalzi as an excellent writer with a fine turn of ankle. IT BURNS!!!! What has been seen cannot be unseen! This is fantastic. I love both of you. While Scalzi perfected the pose, the site of all that man-hair just, well ICK. Hines, however, has sexier hairless legs and wins in my book. Goggles, Y U No Work! Had to vote for Scalzi even if the head tilt is off. That and there’s no frosting. I am donating $50 to counteract Scalzi’s attempt to BUY votes! But Jim shaved his legs, which earned him a million points! I wonder how many times he had to clean out his razor before he’d finished. I need mental floss now. Jim wins hands down; leg shaving represents true dedication. Ignoring everything other than a legitimate attempt to see who replicated the pose best (not to the best of their ability, but just plain best), I would say that Jim took this round by a good margin. You can say that he’s had more practice, but modeling is clearly a discipline where practice pays off. So fun! John’s costume is better (love the wig), but Jim’s pose is more accurate, so I voted for Jim. But you’re both awesome. I voted for Jim because man HE SHAVED HIS LEGS!! Oh bloody hell. I’m voting for you Jim in the hopes that some good doing will rid myself of the terror or Scalzi in a dress revealing his thigh. Kristine clearly must really love you but I’m wondering did her respect sort of wane the morning after this was taken? At least you warned me. I’m slightly disturbed by the fact that both of you appear to own crossbows. Should we be at all concerned that you both have easy access to crossbows? Forget washing my eyes with soap. Ima haveta BOIL my eyes after seeing Scalzi, but he gets my vote for sheer AUDACITY and EWWW FACTOR!!! LOL!!! Jim, you totally got the pose right. Scalzi’s pose looks a lot less painful. Basically, these are the shoes I was able to borrow from my wife. They are both so great for so many reasons, but I had to give Jim the edge due to the shaving and the slightly more accurate look of concentration. Don’t know if he’s pretending to aim or just trying not to fall over. Any word on the model for the original? How did she sty like that? Or did she? Jim clearly wins for 1) the closer pose, and 2) shaving his legs. Post shave all over body stubble is horrible and you need a *very* understanding partner to cope with that. I did inquire as to the possibility of recruiting Mr. Wheaton, but I’m afraid that’s not going to happen. Not this year, at least. For being a cover posing newb, Scalzi did a great job, and I like that he went that extra mile with the props. Still, I gotta vote Hines. His pose is closer to the one on the cover, and you can’t beat those silky smooth legs. I voted for you because your pose is more carefully matched to the cover and also because you can see Scalzi is trying not to laugh. You sold the pose better. But if this was a gross-off instead of a pose-off, Scalzi would be winning in a landslide, and I do have to give him credit for the spaghetti strap. He’s got you there. 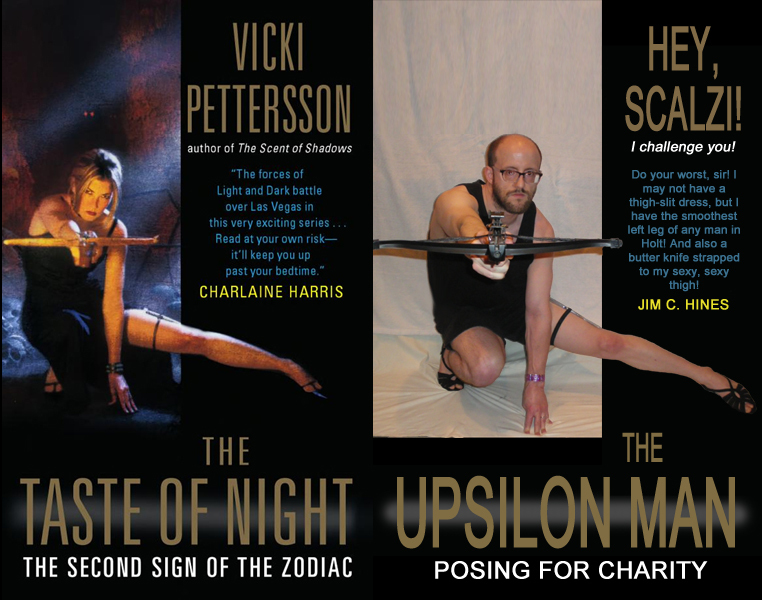 It’s interesting that these pictures started out way back as a way to point out the ridiculous poses women are put in on book covers, because you all seemed so impressed with the leg shaving. You realize women are expected to do that IRL and ALL THE TIME? I acknowledge and appreciate the much-increased irritation of starting with a lot of hair rather than a simple maintenance job. Still, perhaps Jim and others can now understand why that’s so frickin’ annoying to be expected to do daily and you can all spare a little love for those who do. Especially because, IRL, ain’t one of us who’s ever contorted herself into that position on purpose. Mad props to both of you for that. No lipstick? This ain’t over till someone has some nice red lips. Excellent poses by both. Jim has the posing accuracy and the extra points for shaving the leg (LOL), but I voted for John because he has posted a promise on his blog of an additional donation for more votes. Yes, he is shamelessly buying votes, now. Had to vote for Scalzi. I love ya Jim, but the wig and the beard together, that’s got a special place in my heart that I’ll never, ever be able to scrub clean. I’m going to try to do a post this week about exactly that, talking about the ridiculous of leg-shaving and such. I gotta say, I’m maybe most impressed that it only took you one disposable razor. I considered each and the final winner was Jim, if only for the proper pose. And the shoes. My vote goes to Jim–he’s got the pose right, facing the right direction, and isn’t trying to buy votes with a blonde wig. I don’t want anyone to think of me as lacking a sense of humor, but I am *so* pissed right now. Where were you guys when we were searching for cover models? The accuracy of Jim’s pose won the vote from me. Also the leg shaving. Sure, Scalzi’s rocking the wig, but he could take that off right after the photo shoot. The shaved leg now… That’s going to live with you for awhile. What, you don’t have a crossbow just laying around the house? Age of the geek, baby. I voted Jim — as others have noted, the shaving put it over the top for me. Though the wig and LBD were a nice touch from that other guy. But Vicki Pettersson, who did you VOTE for? Yep, I’m a sucker for a guy with shaved legs. I voted for Jim because you just sold it! The expression, the posture and the legs! John’s was more shocking since I am not sure that image will ever leave me but Jim ya just nailed it! But Scalzi’s pose is pretty awesome, and I’m sure it will inspire some cover artist to use it! After I recovered from the laughing, I have to give my vote to Jim, despite John’s very convincing attempt at bribery. I cannot be bought, sir. I cannot be bought. The shaved leg is true dedication. Also, Jim somehow managed to get the shoulder right. Ow. She has a great eye. Looking at the cover and your photos in greater detail I wonder if it’s physically possible to do that pose and have a scooped in waist. My feeling is that it wouldn’t scoop in. Even if you were a woman with a very defined waist I feel like it would be a more continuous crescent from hip to shoulder… certainly not scalloped in as much as it is. Would you mind doing that pose again, but wearing a corset? I could be wrong and I want to see if the scooped waist is remotely possible. … for science, of course. Jim’s pose is nearly perfect. While Scalzi’s is funny, Jim’s left toe point and perfect balance take him over the edge for the win. I’m frankly slightly disturbed at how closely Jim’s left leg resemble’s the cover (and also strangely jealous because I think he has nicer legs than I do…). I can’t unsee either pose, but Jim got my vote because his is more accurate. As lovely and coffee-spluttering as Scalzi’s pose was, I had to go for Jim. Not only far more accurate in terms of positioning, but for god’s sake, Jim shaved his legs! I don’t shave my legs in the winter. That’s some dedication. P.S. Nice legs, Jim! Vavavoom! Obviously your talent agency is limiting itself! Points for Jim: pose accuracy, very lovely shaved leg. Points for Scalzi: costume, bribery for a good cause. I placed my vote for Scalzi ’cause I can totally be bribed for a good cause, and it’ll get us that much closer to the super-special-ultra-bonus pose for $5000.